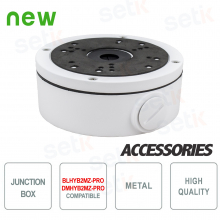 Do you know hybrid motorized CCTV cameras by Setik? What about the two hybrid cameras advantages? But what's this SUPER GIFT? Scatola, box di giunzione in metallo, resistente, compatibile con telecamere setik ibride 4in1 BLHYB2M-ZPRO e DMHYB2MZ-PRO. The JBOXZ is a metal junction box, necessary to install properly the two cameras. The use of the junction box allows an orderly and safe installation and guarantees its watertightness. How to enjoy the promo? Just insert in your cart the BLHYB2MZ-PRO_PROMO or the DMHYB2MZ-PRO_PROMO, the junction box for free is already included with the camera!